These basic deep-fried potato skins are an excellent foundation on which to build. 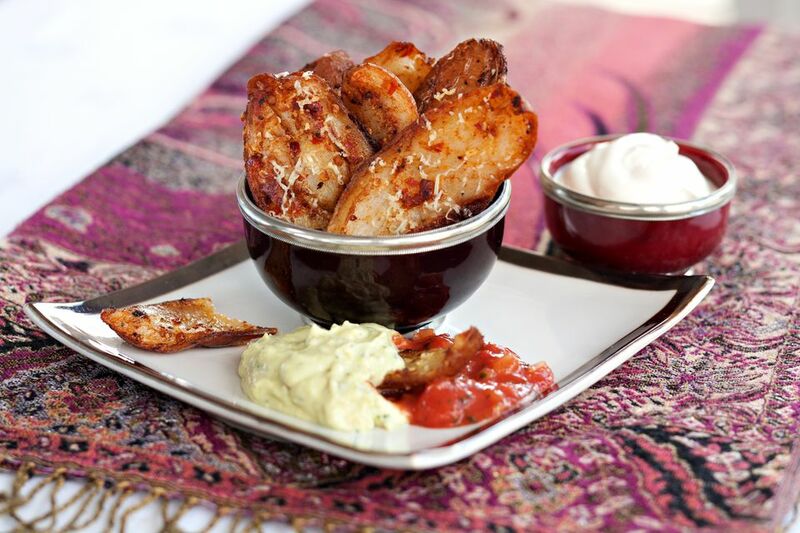 Serve the crispy spuds plain with sour cream and chives or add some simple toppings to them. After the potato skins are fried, consider topping them with cheese. Sprinkle them with shredded cheddar or mozzarella cheese, pepper jack, or a Mexican blend of cheeses. Place them on a baking sheet and place it under the broiler until the cheese has melted. See the variations for more great topping ideas. Make these crispy potato skins for a game day gathering or family snack. They'll be an instant hit! Prick potatoes in several places with a fork; bake in a 400 F (200 C/Gas 6) oven until tender, about 1 hour. Remove the potatoes from the oven and cool slightly; cut into halves lengthwise. Scoop out the potato and refrigerate for another meal or casserole topping. Cut the skins in half again. Heat the oil in a deep fryer to 370 F (188 C). Place potato skins in deep fryer basket; lower into oil and deep fry for about 2 or 3 minutes, or until skins are browned and crisp. Transfer the potato skins to paper towels to drain. Sprinkle with salt and pepper. If you are making several batches, keep them warm in a 200 F oven while frying subsequent batches. Serve with sour cream and chives. If desired, or top with cheese and place under the broiler to melt. High starch russets or Idaho potatoes have the best flavor and shape for baked and fried potatoes. Possible dips for potato skins include guacamole, tomato salsa or salsa verde, chipotle mayonnaise, ranch dressing dip, or aioli. Mash the leftover potato and use it to top a cottage pie or add it to meatloaf. Another ideal use for the leftover cooked potatoes is potato pancakes. Or make hash, gnocchi, or croquettes with them. Pizza Skins: Top the potato skins with a drizzle of marinara sauce, mini or regular pepperoni, chopped bell pepper, and mozzarella cheese. Place them under the broiler for several seconds, or until the cheese has melted. Cheeseburger Potato Skins: Top the fried potato skins with browned ground beef, diced cooked bacon, and shredded cheese or a drizzle of cheese sauce. Pulled Pork Potato Skins: Top the fried potato skins with shredded pulled pork, a drizzle of barbecue sauce, and a spoonful of coleslaw. Broccoli Cheese Potato Skins: Top the potato skins with hot steamed broccoli and a few tablespoons of cheddar cheese sauce.